Home-made and locally sourced food. Beers from the Toppesfield Green Man and Wylde Sky breweries. Our own community produced cider. Friday night is ‘Race Night’ raising money for The Greyhound Trust. Come along to enjoy the fun and support a good cause. Saturday afternoon. ‘Four Square’ tournament. Saturday Evening. Sharp Set + support and open mic sessions. Please also see the latest Chairman’s Update for the latest news from the campaign. To consider the Society’s future strategy and development. In accordance with the Society’s Rules, all members of the Management Committee are required to stand down. Anybody interested in being nominated for election onto the Management Committee should advise the Secretary at Secretary@strap.org.uk. before the meeting. No nominations will be accepted at the meeting. Elections for the appointment of members onto the Management Committee will be held at the meeting. SHARE SALE OFFER CLOSED ON 31 JAN 2018 – £250,000 TARGET REACHED! Would you like to see Saffron Walden’s first community-owned pub? Save The Railway Arms Pub (STRAP) is a campaign to save a great old public house in Saffron Walden and to create a community pub that locals can be proud of. You can download Share Offer Prospectus, Our Business Plan and our Model Rules below. Please also fill in a Questionnaire to tell us what you’d like to see in the new pub. How much is raised so far? So far 291 people have purchased shares and we have raised £250,000 and thus we have reached our £250,000 target! The plan is to save The Railway Arms pub through a community buy-out and re-open it as Saffron Walden’s first Community Pub. We are proposing that The Railway Arms pub on Station Road in the town should be brought back from the brink and kept as a pub. 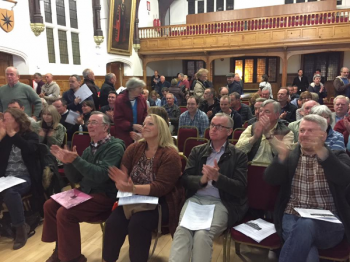 The Railway was officially registered as an Asset of Community Value (ACV) at a district council meeting on 30th March 2017. This was a great victory in the face of strong opposition from the owners, and things have moved on massively since: we now have raised our initial target of £250,000 in share applications, which puts us on a great footing as we attempt to buy the Railway. Take a look at our Facebook page and Twitter feed for regular updates on the campaign. £250,000 target reached – now we’re trying to buy the pub! With our share issue closed and the initial target reached we are now trying to actually purchase the pub. We’ll send out news as it materialises. 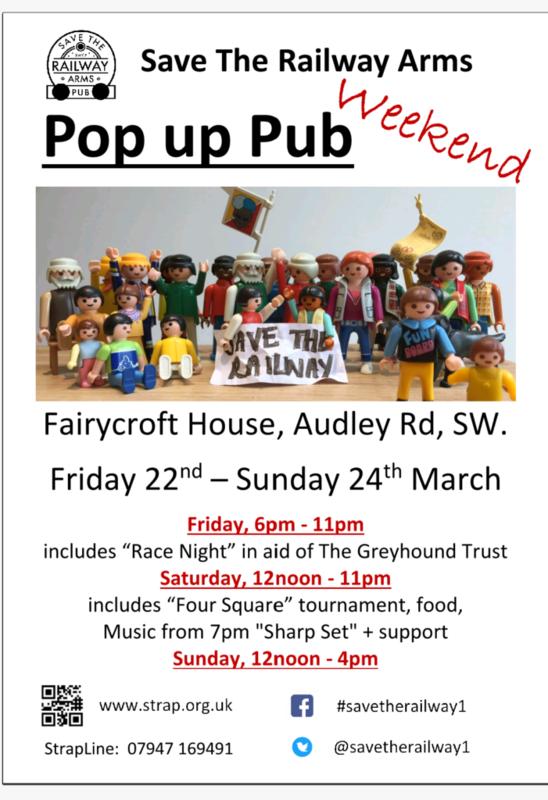 Come along to our next Pop up Pub event – details to be posted on the website in due course. We will post regular information about the proposals for funding the purchase of the pub and the initial renovation and running costs. It is estimated that approximately £400,000 will be required to get things up and running, and the majority of this money (£250,000 to date) has been raised from a community share issue. Other funding has been acquired through grants and community loans. What is a community share issue? Our application to establish a Community Benefit Society called The Saffron Walden Community Pub Ltd has been accepted by the Financial Conduct Authority. Anyone interested is invited to purchase shares in the society/pub which would given them a vote on all major decisions in relation to the management strategy and how the pub is eventually run. Whether someone purchases a single share or a hundred, and invests £50 or £5,000, each member of the Community Benefit Society will have one vote only. In addition, though the value of the shares will not increase, it is proposed that there will be an interest dividend that is paid annually to shareholders, the rate of which will be set annually. Shares may only be sold back to the society. The share issue has been assessed by HMRC as eligibale for the Enterprise Investment Schemes which means that investors are able to claim tax relief of 30% – 50% on their investment. The Share Prospectus and our comprehensive Business Plan have been published and are available to view (see button above). If you are interested in the STRAP campaign, please come along to the next event (details of which will be posted on our website, Twitter feed and Facebook page). We’re really excited about our recent Pup up Pub events as they have allowed us to meet regularly, share news and updates, meet new people and old friends and talk about the things that interest us and others – just like we’d do in the Railway in fact. The first three events were brilliant, and we expect future events to be better still! If you can’t make it to the next event, submit your email address above and we’ll send you further information and news as it arises. If you’d like to ask any questions about the campaign, or indeed if you’d like to put forward any ideas or make any suggestions, please fill in the form on our contact page.